(CNSNews.com) - The federal government collected a record $1,683,537,000,000 in individual income taxes in fiscal 2018 (October 2017 through September 2018), according to the Monthly Treasury Statement released today. Despite the record amount collected in individual income taxes in fiscal 2018, overall real federal tax revenues in fiscal 2018 were lower than in any of the previous three years. In fiscal 2018, total tax collections equaled $3,328,745,000,000, according to the Treasury statement. That was less than the $3,446,613,230,000 (in constant September 2018 dollars) that the Treasury collected in fiscal 2015; less than the $3,415,674,450,000 (in constant September 2018 dollars) collected in fiscal 2016; and less than the $3,390,373,210,000 (in constant September 2018 dollars) collected in fiscal 2017. 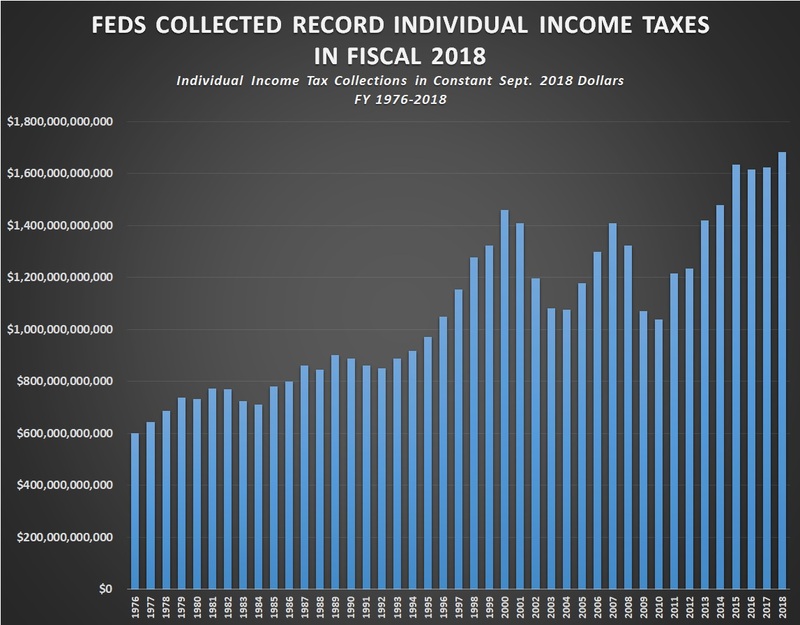 While the federal government was collecting more income taxes from individuals in fiscal 2018, it was collecting less from corporations. Total corporation income tax collections in fiscal 2018 were $204,733,000,000. In fiscal 2017, they were $303,811,700,000 (in constant September 2018 dollars). In fiscal 2016, they were $313,233,700,000 (in constant September 2018 dollars); and in fiscal 2015, they were $364,738,790,000 (in constant September 2018 dollars). In addition to the individual and corporation income taxes it collected in fiscal 2018, the federal government also collected $1,170,700,000,000 in Social Security and other payroll taxes; $94,988,000,000 in excise taxes; $22,283,000,000 in estate and gift taxes; $41,299,000,000 in customs duties; and $110,505,000,000 in miscellaneous receipts. 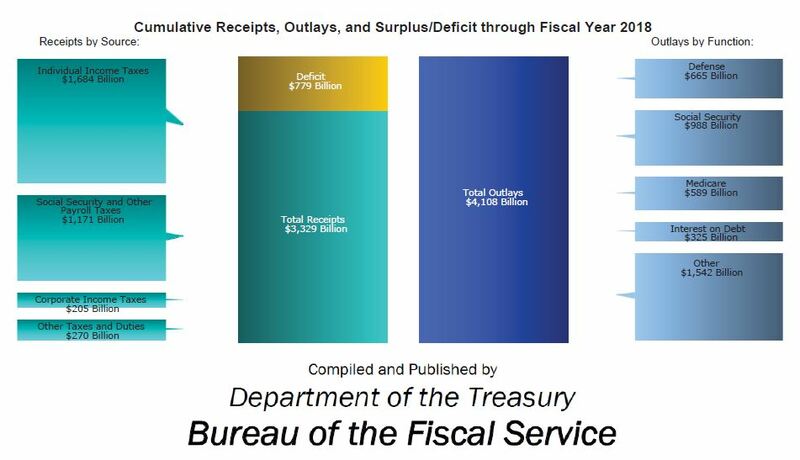 The federal government ran a deficit for the fiscal year because while collecting $3,328,745,000,000 in total taxes it turned around and spent $4,107,741,000,000.